Today, Thursday February 7 of the year 2013, has been a long and busy day, and it’s far from over. This morning myself, herself, and +1, rose at 6am as we always do, but instead of feeding and returning to sleep, we dressed in a panic, and bailed into the car in sub-zero temperatures. A trip to the airport was afoot. Why? Well, mammy and daddy were on their way to Korea! It’s kind of a childish thing to describe my parents, or mother and father, as mammy and daddy, as opposed to ma and da, or the ould won and the ould fella, but it’s certainly better than calling them Mum or Mom, and Dad. Not that there is anything wrong with calling one’s parents these, it’s just not Irish, at least not where I from anyway. However, for the rest of this post I shall refrain from calling them mammy and daddy, as that is now how +1 is shaping up to call herself and I at some stage in the not so distant future. How times have changed. The arrival of the ould pair is a welcome turn of events. Last time we were together was in August 2011 after my brother’s wedding, and since then much of the communication has been through skype. We have not really sensed too much distance, maybe because we’re used to the separation, which was until we actually met them in the airport. Physical bonds and connections can sometimes be under-rated. I know that there are plenty of so called expats in Korea who have probably not seen their parents in a much longer time than I. But I reckon I’m still old enough to pine for their company a little. Still, let’s face it though, probably the most important reason they’re here is to see +1. She is the first grandchild on both sides of the family, and that means she is in line for some serious dotage. Herself’s parents are definitely keen on making sure that +1 gets pride of place in all family events, and I think it’s about time that she got some Irish molly-coddling! A full suitcase at least of clothes, toys, and other gifts came along with my ould pair this morning, not to mention a whole host of gifts from family and friends who managed to link up with the caravan of supplies before it embarked towards Korea. So long story short; we’re spoiled rotten right now. The thing is, while I survive quite comfortably here in Korea without things like black and white pudding, bacon (the Irish kind), decent chocolate, and a whole host of other ‘delicacies’, receiving a delivery of supplies really makes it feel like a second Christmas. 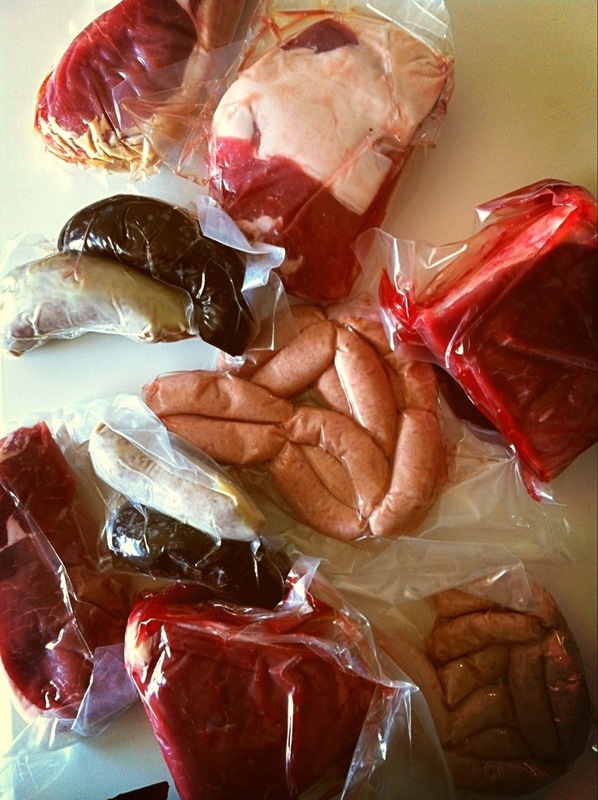 I think Korea has a fine tradition of food, and it certainly makes living here much easier, however if there’s one thing that Korea really needs to think about introducing to the national diet it’s more cured pork products. Frankly, I believe that the world needs more of them, and Korea would be a better place with a tradition of curing pork. If you think it’s beyond them, I point you to kimchi, which is essentially cured cabbage with the essential preserving ingredient being salt. However I am not sure if I’m willing to advocate a kimchi-pork type concoction…actually I am, although not in the vein of kimchi jiggae. In fact anything would do as long as it’s not that excuse for ham you find littered around supermarkets. Where am I going with this? Oh yes. Korea, cure some meat for Christ’s sake. On another note, based on the aforementioned arrival, Korea also lacks something else important, and that’s cheap baby clothes. It’s crazy. Really. Yeah I know you can buy everything cheap online, but frankly I don’t trust buying everything on the internet and I can’t see the economy progressing if everyone is relying on 택배 to survive affordably. Anyway (avoiding a rant here), if you go to any supermarket or department store with clothing, baby clothes are extraordinarily expensive. In fact all clothes are extraordinarily expensive, especially given the quality. Even everyday outfits made of simple cotton with cute designs, are often not cute and over-priced. 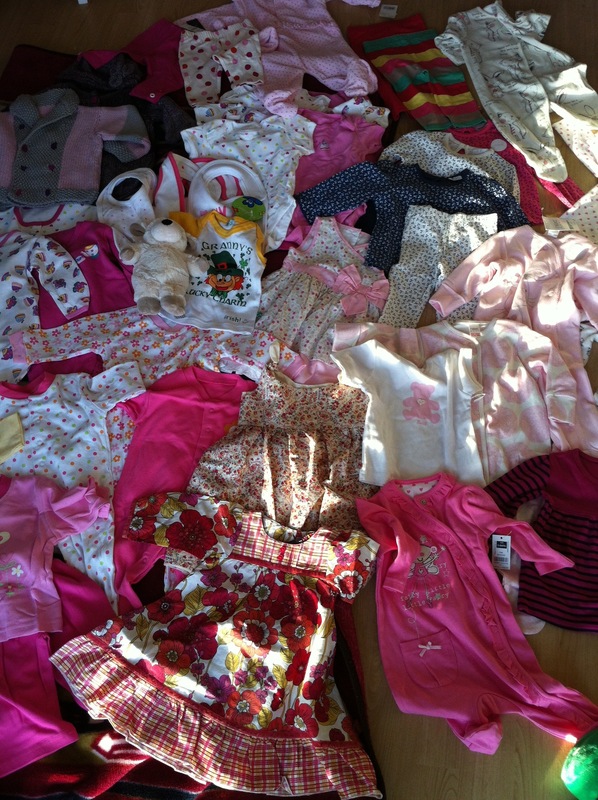 Even Ireland has cheaper alternatives than Korea, which is why +1 was supplied with half a suitcase of baby’s clothes! If only she was cognisant enough to realise the significance of this. But for now what’s important is spending time with the folks before they head back to Ireland in a few weeks. We’re not sure when we’ll get a chance to see them, and it’s important for +1 to know them, as she is loved very much by all my family but the physical distance presents a distinct barrier to actually developing a relationship. While I know that she is far too young to actually remember or react to this first meeting, I think my parents couldn’t hold themselves back from visiting, even if it is a balmy -12 outside (say nothing of the wind chill). P.S. Added fun from next Sunday, my brother and his lovely wife will arrive from London! I’m preparing another list! This entry was tagged 2013, baby, clothes, daughter, family, father, february, first time, gifts, grandparents, Ireland, Irish, korea, korean food, letter, life, living, love, Main Menu, Parenting, visit. Bookmark the permalink.